My wife and I began trawler shopping in January 2007 and soon realized that getting Striper, our 45-pound Portuguese water dog, on and off the boat and into the dinghy while anchored might present a problem. Knowing that many other cruisers travel with petsand that neither we nor our pets are getting any youngerwe thought the story of our search for a solution to this predicament might be of interest to other readers. When we first began shopping for a boat, we looked at basic boat designs including pilothouse trawlers and trunk cabin trawlers. 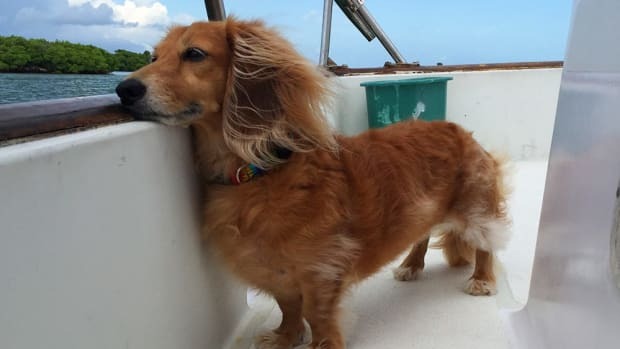 The pilothouse trawlers offered the ease of allowing the dog to simply walk from the deck level through the stern door, onto the swim platform, and into the dinghy. However, the pilothouse boats also had a flybridge that required climbing a ladder, something the dog could not do on her own. She is too large and heavy for us to carry up and down the ladder. The trunk cabin trawlers, however, offered a flybridge that allowed relatively easy access for the dog. She could use the steps from the deck onto the trunk cabin top, and then easily make her way up the two or three steps to the flybridge area. We felt it important to have a boat layout that allowed the dog to be with us and to move about the boat on her own. The trade-off is that the trunk cabin trawler has a deck level that is about 3.5 feet above the water. This meant that our challenge was to figure out the best way to get Striper to and from the dinghy from deck level (photo 1). We read many articles and books and had personal and online dialog with other cruisers traveling with pets. We gleaned a lot of great information, but really nothing that would quite work for us. Next, we consulted various ramp, stairs, and float manufacturers and concluded the safest, most easily stowable, and efficient means would be a ramp. Piece of cake, I thought, since I had already built one a few summers earlier for my Parker fishing boat. A few limited modifications and wed be good to go. That June we took delivery of Say Good-Bye, our 1982 41-foot DeFever. It became obvious there were no modifications that could be made to our existing ramp that even came close to fulfilling our needs. The freeboard was too high, the swim platform too narrow and slotted, and a set of St. Croix davits protruded from the transom just above two staggered steps leading to the opening to the aft deck (photo 1). Placed sideways across the stern with the lower end of the ramp on the swim platform, it slanted upward to rest on top of the uppermost staggered step. It was heavy, very steep, and very unstable. I intended to provide stability by building a hinged brace that the ramp would connect onto. We set it up as a prototype experiment to see if the concept would work and if it warranted the fabrication of the hinged brace. In doing so, we discovered that the davits protruded over the ramp near the top and the dog had to crouch abnormally and then hop on board. It was unsafe for her and for us assisting her. We discussed ordering a lighter weight customized ramp, but the other issues remained the same. Scratch that ideaon to Plan B. The life vest we purchased is a Fido Float Life Vest from arcatapet.com for just under $20 (photo 2). Its a padded, floatable doggie life vest with mesh underbelly support that zips up the back. The dog steps into two front leg holes in the mesh underbelly (photo 3) and the vest is zipped snugly (photo 4). The original design of the vest had one woven adjustable strap handle sewn onto the front of the vest near the collar and a second strap handle located near the hind leg area. The front strap goes around the dogs chest, forming a handle on her back near her head but lifts her from underneath. We had The Ships Tailor (a local canvas and sailmaker) add a woven adjustable strap just in front of the dogs hind legs, going around her belly area, thus reinforcing the second handle on her back near her tail. This modification affords total support from underneath and distributes her weight evenly between the two handles. The woven straps are adjustable to fit comfortablynot too tight, nor too loose. Of course, if youre planning on creating a similar sling for your pet, its absolutely vital that you make sure the supports are fully capable of holding him or her safely. .and best of all, Striper likes it! One caution for dog owners: Dont just lift your dog with the boom and expect the dog to cooperate. Training is essential so the dog knows what to expect. We started by putting Striper in the vest, then manually lifting her a few inches off the deck allowing her to hang while holding her. We rewarded her with a treat, petted her, and verbally reinforced the good behavior. We repeated this several times so that she associated getting into the vest and being lifted with a fun and rewarding activity. Next, using the block and tackle, we lifted her higher to the level needed to get her over the sternrail. Again, we reinforced the maneuver with a reward and repeated it several times. Finally, we went for broke and lifted her up, over, and down, disconnected the apparatus, and she hopped into the dinghy. ..exploring the land areas and beaches, the essential personal relief, and of course, all those dog treats!